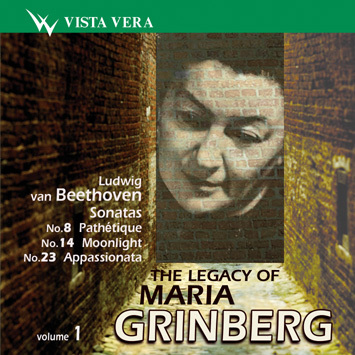 Maria Grinberg was probably one of the greatest pianists of the 20th century. I have never heard anybody matching her most brilliant performances of Schostakovich's Preludes and Fugues, and the First Concerto, or Schumann's Symphonic Etudes, Children's Scenes and the Piano Concerto, or Schubert's impromptus of both opuses (perhaps, with the exception of Maria Yudina), Brahms' First Concerto, Bartok's In the Open Air, Beethoven's many sonatas, whose slow parts performed by Maria Grinberg are, for me, "the X-rayed soul". Unfortunately, Fate's sardonic grin had long haunted this fragile small woman who was neither a warrior, nor a fighter, nor even a maker of her artistic career. Maria Israelevna (or, Musya to her relatives and friends) was born in 1908 in Odessa. Her father taught Hebrew, which after the Bolsheviks seized power, nobody in Russia needed any longer. Her mother taught the piano to a number of beginners. In fact, the family lived on the verge of poverty. Until the age of 18, Musya was taking (free of charge!) piano lessons from Odessa's best teacher David Aisberg. Interestingly, she played the instrument purchased by her local financial sponsors who immediately noticed the little girl's talent. Eventually she became a pupil of F. Blumenfeld and later, continued her studies with K. Igumnov at Moscow Conservatoire. In 1935, she captured the Second Prize at the Second All-Union Pianist Competition. It seemed then that she had every right to become a popular public performer. But in 1937 Maria Grinberg's husband and her father were arrested and executed as "enemies of the people". The pianist was evicted from the Philharmonic and got a job as an accompanist for a choreography group with the cultural department of Moscow's Kauchuk plant. In a while, though, she was readmitted to the Philharmonic as a piano soloist. She performed before the tightly-packed halls in Moscow, Leningrad, Riga, Tallinn, Voronezh, Tbilisi, Baku and other cities all over the Soviet Union. At 50, only after Stalin died, she was allowed to travel abroad. All in all, Grinberg went on 14 performing tours -12 times in the Soviet bloc countries and twice in Holland where she became a nationally acclaimed figure. Critics enthusiastically compared her dazzling performances with those of Horowitz, Rubinstein, and Clara Haskil. However, Soviet media never reprinted those laudatory reviews. Only at the age of 55, she was granted her first - and last - honorary title of the Distinguished Artist of the Russian Soviet Federation. Only at 61, she was given a professorship of the Gnessin Institute of Music. But neither Moscow Conservatoire, nor the jury of the Tchaikovsky International Competition offered her a seat. In 1970, her personal 13-LP album set featuring all Beethoven's 32 sonatas was released. The Soviet musical press uttered not a single word of the unique event. Only three months before the pianist died, in 1978, critic Yudenich called these recordings in the Sovetskaya Muzyka magazine "a true feat in the art". Not a single filming of Grinberg's live performances was made for TV or the silver screen. Well, let's put sad things aside. She had had enough sadness in her life. I am truly happy that these disks are being released now to bring you so much joy. Maria Israelevna once said to me, bitterly: "I'll get it all - after I die".